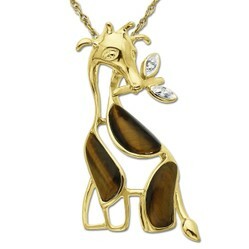 The graceful and gentle giant of the African Plains makes the perfect gift in a dazzling Diamond Giraffe Necklace. Any fan of this beautiful safari animal will adore this jewelry. What a truly gorgeous necklace design the elegant giraffe makes with its long and graceful neck that seems to stretch up forever. Only the brilliance of the diamond gemstone can do justice to this wonderful and wild creature. You will discover an enticing selection of Giraffe Diamond Necklaces on this page which will make a wonderful gift to yourself or for someone else who appreciates this gentle Safari animal who grazes on the African Savanna. This is the most magnificent diamond giraffe pendant I've ever seen. The pendant hangs from a beautiful yellow gold rope chain. The gorgeous giraffe is fashioned from a 10k yellow gold which is inlaid with a rich brown Tiger's Eye stone to represent the unique giraffe markings. This little guy has ben captured doing what giraffes do best - eating leaves! These leaves have been detailed with stunning white diamonds. What I love about this pendant necklace is that is has an unusual amount of character which is often lacking in animal jewelry. The face has so much detail with the giraffe's floppy ears and his hair covered horns which are called ossicones and not antenna as many people think. If you're on a tighter budget there are other diamond necklaces featuring the giraffe which are almost as lovely and would be adored by anyone who is a fan of these wonderful creatures. In fact, one of these giraffe pendant necklaces would be perfect to gift to a baby as a present that they will appreciate when they grow older. My Godmother gifted me a beautiful gold necklace at my christening and my parents gave it to me when I turned 16. It was very sweet to know that it had been specially chosen for me all those years before. It turned out that she was worried that she wouldn't be around when I got older and she wanted to ensure that she left a special gift which I would treasure forever - and I have. With these diamond giraffe necklaces, you really appreciate the form of the animal who is standing proud and they are inset with 4 pretty little diamonds which make the whole design sparkle. If you want to look at other options for giraffe jewelry, take a look at some of the pieces that eBay has to offer. I love to browse through eBay because you never quite know what you're going to find. You can get some truly unique pieces on that site which you may never find elsewhere. I wish you happy hunting with finding the right giraffe gift. 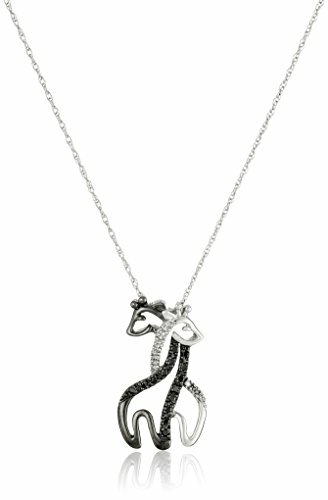 Fine Sterling Silver Diamond Giraffe Charm Pendant Necklace, 18"
Did you fall in love with a Diamond Giraffe Necklace? Yes I'm on a total giraffe roll at the moment, aren't I! Thanks, Sheila. I love your giraffe theme. You've found some great stuff.